Benazir Bhutto was not only chairperson of PPP for life but designated her husband as successor for leadership in her will. 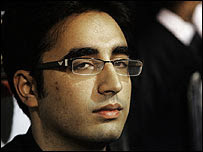 Her husband decided to name his son Bilawal to succeed while maintaining effective control of the party himself as co-chairman. It all stays in the family, like the rest of their wealth and other vast possessions. This only confirms the undemocratic nature of Pakistan's elite that includes Benazir Bhutto and Nawaz Sharif, also chairperson for life of of his party PML(N). As long as Pakistanis accept this behavior of their "leaders", they will continue to be ruled by a small elite that disenfranchises them. The only way out of this monarchical system is to let the current economic growth continue in Pakistan that strengthens the size and the power of the middle class to develop sufficient clout to bring about real broad-based democracy based on rule-of-law. For those interested in a broader perspective of this development, please read my blog entry titled "Who Owns Pakistan".